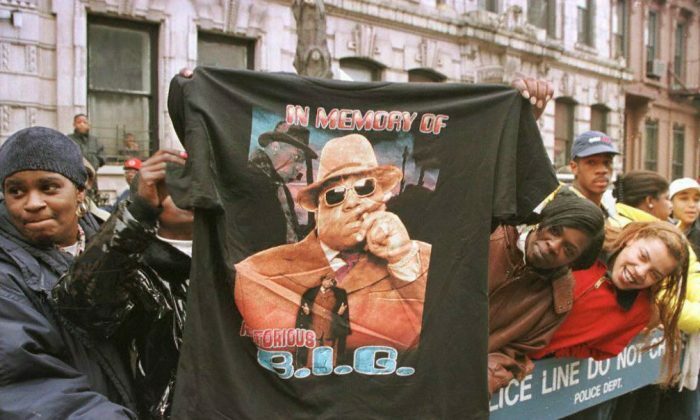 Biggie Smalls, known as The Notorious B.I.G., was remembered on Sunday–16 years after his death. Biggie, born Christopher Wallace, was gunned down in Los Angeles on March 9, 1997, after leaving an after-party hosted by Vibe magazine. On Twitter, his death was remembered Saturday. “Happy Biggie day to all the believers,” wrote one person. “R.I.P Biggie Smalls. You’ll always be one of the greatest! Rest in peace dawg. Your legends lives!” wrote another person on Twitter. He achieved commercial and critical success with “Ready to Die,” considered a hip-hop classic. Biggie was shot and killed while he was in a GMC Suburban with his entourage waiting at a red light. A black Chevrolet Impala SS pulled up next to the vehicle and the driver fired shots at the Suburban, with four shots hitting Biggie. Biggie’s autopsy was released to the public in December 2012. According to the report, three of the four shots that he suffered weren’t fatal. However, the fourth bullet proved to be the one that killed Biggie, hitting several vital organs. It’s unclear who shot him. He was 24 when he died.